Larry Blamire is the writer-director-star of The Lost Skeleton of Cadavra , Trail of the Screaming Forehead, and the recently released The Lost Skeleton Returns Again and Dark and Stormy Night . He is also the author of Tales of the Callamo Mountains , a collection of western horror short stories, as well as a former science fiction illustrator. Larry has several published plays, including his own versi on of Robin Hood, performed hundreds of times all over the world. LB: I saw pictures in Famous Monsters of Filmland after the fact. 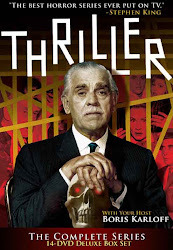 Thriller seemed like this late night horror show, more adult somehow than Twilight Zone. That was the impression to this kid anyway; it had this mystique, this "rare" feeling. It wasn't until I was an adult that I finally caught it in syndication. JS: How did you come to become involved with the Thriller DVDs? LB: My buddy Dave Schow roped me in. I had written a collection of western-horror short stories, Tales of the Callamo Mountains , and he also knew I was a nut on TV western horror—episodes of "normal" western series that take a hike into Strangeville. He thought he and I could do Thriller's two weird westerns, but we only ended up doing "The Hollow Watcher." After viewing "Til Death Do Us Part," we realized there just wasn't much to talk about. PE: So once the westerns were exhausted, how did you decide which other episodes you'd participate in? LB: (Schow) asked what others I liked and when I mentioned two of my favorites, and they were actually CRIME SHOWS, he and Steve Mitchell knew they had a sucker—I mean, aficionado. They were hoping somehow, some way, at least SOME of the dreaded crime episodes would be covered by commentary. "Late Date" is a lean, economic, suspense-noir, beautifully shot, performed and scored (Goldsmith) that I find irresistably compelling. Now, "The Storm" I would argue is actually horror. Since it's kin to an "old dark house" thriller David thought it would be a perfect one to do, because I had just spoofed the genre in my film Dark and Stormy Night . "Storm" has similar roots to old dark house stuff—originating in the gothic lady-alone-in-a-house-in-peril scenarios. Dave wasn't familiar with that show and found it a pleasant surprise. Add "Man of Mystery" and I did a total of four eps. LB: The boring answer is "Pigeons From Hell." I know, so many call this one favorite. And I saw it AFTER reading King's comments in Dance Macabre! So it wasn't over-hyped for me. I think it's interesting that John Newland directed that and the other Stephen King favorite scary TV show, the "I Kiss Your Shadow" episode of Bus Stop. JS: We now turn to our questionnaire— what's your favorite Thriller? LB: The melding of music and cinematography; the killer combo really evokes. LB: Predictability. I guess we're a bit jaded now, but I try and overlook it, try and put on a kind of retro mindset. Some really telegraph. One other thing: man, for a mostly horror series it's surprisingly monster-free. I wish they'd tackled something like E.F. Benson's "And No Bird Sings" or Conan Doyle's "Terror of Blue John Gap", you know? Outer Limits did monsters on a budget—Thriller could too. More monsters, please. LB: Dread. What's a single word for that "sense of dread". LB: "Masquerade". It's like the longest joke in the world. With a punchline you see a mile off. Probably more effective as a short story in the 40s. Forget the crime show flops—this is such a missed opportunity; you're going to do a Kuttner story and this is it? Why not "The Graveyard Rats"? Anything! PE: Thanks Larry! Be sure to check out Larry's commentaries on "Late Date," "The Hollow Watcher," "The Storm," and "Man of Mystery." Great to hear from Larry on this topic. I really enjoyed his work on the Thriller set and hope he does more commentaries in the future. "Masquerade"....Oh dear, one of the shows finest, in my eyes, too! Such a marvellous blend of comedy and horror, superior to Whale's '"Old Dark House" and the Hope comic horror vehicles in the late '30s. In fact, not sure it not the best of it's type ever. I know the feeling; Alan Brennert, in his interview, just named "The Hollow Watcher" one of the worst--one of my favorites!